Israeli Ambassador to the UN, Ron Prosor, addressing the UN General Assembly on the UN Holocaust Remembrance Day. Thank you, Mr. Under-Secretary General. 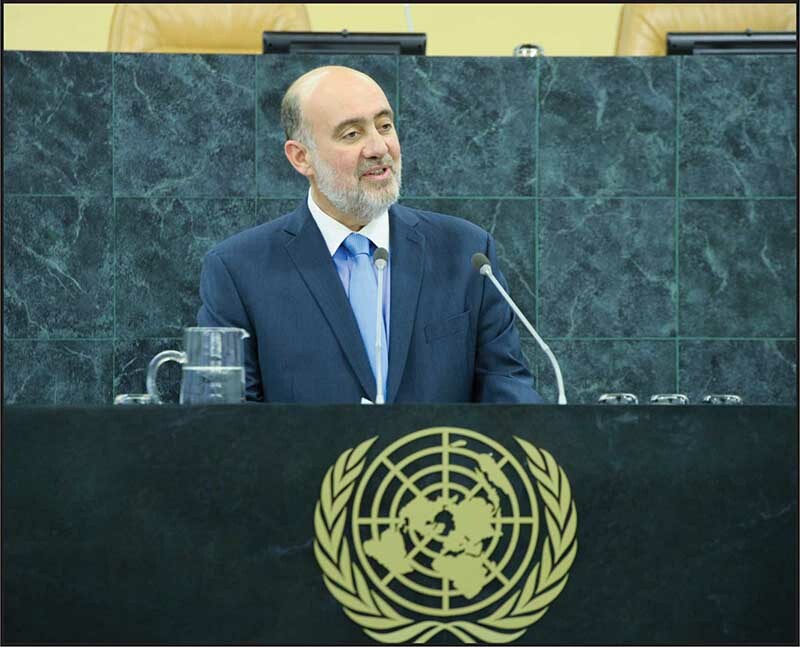 Dear survivors, Distinguished delegates, Ladies and gentlemen, Mr. President, I, Ron Prosor, the son of Uri Prosor who fled Nazi Germany, stand before you tall and proud as a representative of the Jewish nation in the Family of Nations. When my father fled Berlin in 1936, the world wavered on the brink of war - the League of Nations was unable to unite the world and stop Nazi Germany from casting its dark shadow over Europe. robbed of their families, robbed of their dignity and then robbed of their lives. Europe into the dark abyss. " Mr. President, The Jewish people have been tormented, exiled and persecuted like no other people in history - but we never gave up. In the ghettos and concentration camps, Jews established schools and synagogues. They celebrated holidays and weddings. They made music, sang and danced even as death loomed all around. Joachim Joseph was just 12 years old when he was taken to the Bergen Belsen concentration camp. As his thirteenth birthday approached, Joachim studied in secret to prepare for his bar mitzvah using a small Torah scroll smuggled into the camp. On the day of his bar mitzvah, Joachim sang aloud from that scroll. When the ceremony concluded, the boy was given the tiny Torah with the hope that he would survive the war and tell the world how even in the midst of Jewish suffering, Judaism survived. Today, Joachim is a renowned physicist living in Israel. His story of survival defied gravity when his Torah scroll accompanied Ilan Ramon, Israel's first astronaut, into space. In a live teleconference from the Columbia space shuttle, Ilan Ramon shared Joachim's story and explained that the small scroll represents: “The ability of the Jewish people to survive. It represents their ability to go from black days, from periods of darkness, to reach periods of hope and faith in the future." Mr. President, We survived because of those individuals who struggled to keep their Jewish identity alive and fought for a Jewish future. Jews and gentiles alike – fought for our future. Approximately 1.5 million Jews fought in the allied forces during World War II. Others organized resistance movements that took up arms in the ghettos and concentration camps, in the villages and in the forests. They retaliated with major uprisings in Warsaw and Bialystokg; They resisted with underground activities in Dachau, Maidanek and Buchenwald; They rescued and hid other Jews; And they refused to accept the inevitable by fighting for their lives in the death camps. The Jewish people survived because courageous men and women stood up for what was right and risked their own lives to save others. The untold story, but no less important, was the active Jewish involvement in saving other Jews. Ordinary people like Madeleine Dreyfys – a French Jewish psychologist – risked their lives to save other Jews. While pregnant with her own child, Madeleine transported hundreds of Jewish children out of harms way to find refuge in the French countryside. As part of the Garel Network kinder transport Madeleine personally saved more than 100 Jewish children. 300 Jews were saved by Righteous Gentiles, Johannes Post and Arnold Douwes who worked together with Max “Nico” Leons, a young Jewish man, to rescue the Jews in the tiny village of Nieuwlande in Holland. Nico, who was a Jew, had the right papers and could have chosen to save himself, but instead he put his life on the line for the benefit of others. While Johannes was caught and executed by the Nazis, Arnold and Nico survived. We are here today, because of those people who did the right thing; the Jews and Gentiles who fought for our future; who proved that even in the darkest hours of human history, the human spirit prevailed. Mr. President, From the ashes of the Holocaust and the depths of despair, the Jewish people returned to their ancient homeland; regained independence; built schools and hospitals; made the desert bloom; and built a strong and vibrant society. One of the survivors who helped build the modern State of Israel was Malka Gantz, a Hungarian Jew who survived the notorious Bergen-Belsen concentration camp. I had the privilege of knowing Malka after she immigrated to Israel and built a family with her husband, Nachum. Today, their son, Benny Gantz, is the Chief of Staff of the Israel Defense Forces. Last year, Benny, a personal friend of mine, travelled to Auschwitz and lit one of the six torches in memory of the victims of the Holocaust. At the ceremony he said, "Never again shall a calamity such as this transpire in our world...we will never ever stand unready to defend ourselves." The Jewish people want peace, but history has shown that we cannot rely on others to defend us. We are resilient and we are also realistic. It has been almost 70 years since the end of the Holocaust and the world is still plagued by prejudice and - even as we speak - anti-Semitism is being sponsored and spread by governments, teachers, and religious leaders. The Holocaust taught us that remembrance without resolve is meaningless. It showed us that awareness must be matched with action. I encourage governments to take Action by partnering with UN Information Centres to educate the next generation. In doing so, you will pay tribute to the victims of the Holocaust and take a stand against indifference. The International Holocaust Memorial Day was proclaimed in 2005 with the personal drive of then Foreign Minister Silvan Shalom, who sought to institutionalize this Important day, not just in Israel, but around the world, making it possible to educate future generations. Today, I stand before you, before the nations of the world to tell you that there once lived a man named David Berger. He was born in the Polish town of Przemysl. His parents were Chaim and Sarah. His siblings were Manya, Mechel and Mundek. At the age of 19, David was killed because he was a Jew. In 1941, there was no Shield of David to defend David Berger. Today, the State of Israel and the Israeli Defense Force are standing guard day and night over the nation state of the Jewish people. But we should not be standing alone. The Holocaust wasn't just a Jewish tragedy; it was a human tragedy. I look around the world today and still see children being taught that some human lives are worth less than others. And I still see men and women executed for what they look like, and how they worship, and who they love. compassion, and tolerance. Children must be educated in these qualities and taught that when they see hatred or prejudice, they must take action by speaking up and stepping in. The United Nations was borne from the bloodshed and brutality of World War Two to stand up for humanity. It is a responsibility that each of us carries every single day. Never again can evil be allowed to take root. Never again can silence prevail. Never again can indifference reign. The State of Israel is the only guarantee that the future fate of the Jewish people will be held in our own hands. It is our hope for the future and the assurance of our survival for generations to come. Am Yisrael Chai! Long live the People of Israel!